Reading a well-written book in a cozy nook in your living room or library while cradled in a piece of furniture like the Homall Single Recliner Chair is both relaxing as entertaining. The way recliners lean back just when you laugh at a funny passage or the way it can comfort you while you sob at another failed love story makes it a great addition to any living space around the house. Imagine placing a reclining chair beside a tall lamp with a soft rug underneath and warm logs slowly burning in the hearth. Add shelves lining the walls of the entire room, fill each one out with books and you have a bookworm version of heaven on Earth. While it’s true that some readers prefer reading while lying down or seated on a rug, nothing beats resting your back on soft leather and your feet on the footrest. This way, you can take a quick nap after a boring, erm, tiring chapter or maybe even go directly to sleep, just because you could. Nevertheless, it is still advisable to look into recliner chairs just because they bring comfort that no other furniture can. So without further ado, here is one of the most favorite recliner chairs on the market. The cushions of the seat and backrest, as well as the footrest, is made of high-density foam which is thicker yet softer than the usual foam used for recliners and chairs. This means that the padding of this recliner chair is highly resilient and permeable, which make it more comfortable to sit on and enjoy reading from. The Homall chair has a push-back full recliner design with wide armrests and a large-sized seat for extra comfort. Pushback recliners require no lever to change modes, just push back on the backrest, and it will lock into position. Push back again to unlock and return to the normal seating alignment. The thickly padded footrest can be extended and retracted to give this recliner chair an additional mode for extra relaxation. This recliner’s footrest is supported by a durable steel frame that also allows it to be adjusted to your preference. The skin-friendly, high-quality PU leather that lines the Homall recliner is easy to clean and is resilient against wear and tear. This kind of leather is also breathable as it allows air to pass through freely, and it also does not stain as easy as normal leather used for regular upholstery jobs. The feet of this recliner chair is made of no-mar rubber which ensures that your hardwood is protected from the usual scratches that it gets from other pieces of furniture like sofas and coffee tables. The no-mar rubber feet of this recliner is also gentle to your carpet or rug, helping you make them last longer. The leather upholstery of the Homall recliner is dual stitched all around to give it a stronger bind, keeping the foam in and the leather out. The lines of the dual stitching also add to the elegance that this recliner chair brings into any room or living space. This recliner chair’s armrest is designed with an upwards curve that has a lesser tendency to tire your arms out, compared with conventional designs. The curvature of the armrest is ergonomic and makes the chair look more modern and compatible with other furnishing styles. The Homall Single Recliner Chair brings extra comfort to your living space with its thick padding and durable frame; all encased in breathable PU leather, which is also soft to the touch and easy to clean. The padding of this recliner chair is made of high-density foam which adds to the comfort that this chair brings into your home. This reclining chair from Homall has three modes: seated, lean back and full-tilt, which you can easily go into by just pushing back on the backrest and waiting for it to lock on the position that you want. The overall design is very ergonomic and modern, while its frame is made of hardwood and reinforced with durable steel. The appearance and features of the Homall Single Recliner Chair are similar to that of the Best Massage Modern Single Recliner Chair, especially the padded backrest and curved armrest that provides ultimate comfort. The Best Massage recliner also has a retractable footrest that fits the mode that the chair is in. 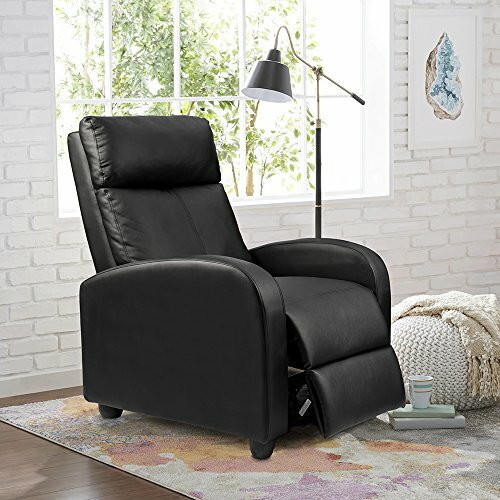 This recliner chair from Best Massage is lined with bonded leather and is stuffed with doll cotton for that extra soft and breathable comfort. This recliner is also waterproof and highly resistant to the sort of abuse that leather chairs often encounter at home, especially if there are kids present. The frame of the Best Massage recliner is made of hardwood and reinforced with steel that also supports the retractable footrest. The design of this chair is very ergonomic, and the curved armrest lets the blood flowing through your arms circulate better. 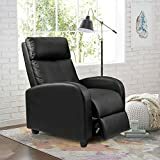 The Homall Single Recliner Chair easily beats out the Best Massage Modern Single Recliner Chair, even though they are both full-recliners that almost look and feel the same. They also have the same push-back backrest recliner and a retractable footrest that shifts with the different modes. The difference, however, begins on the inside. The Homall’s padding is made of high-density foam which makes it better to sit on as it does to bunch up or wrinkle and is also much better to sit on compared to the doll cotton which is used inside the Best Massage chair. This can also cause some discomfort after seating for a while as it tends to flatten as well. The bonded leather upholstery of the Best Massage is waterproof and is easy to clean, which are also the same features as the PU Leather that lines the Homall. However, PU leather is much more comfortable on the skin as it lets your skin breathe, even the parts in contact with the skin underneath the limbs and buttocks. Recliner chairs are a great seating solution inside the living room or in a library or theater room, especially since it is padded and can be adjusted to fit your current comfort needs: full tilt during naps, half tilts while watching TV or while playing video games and untilted for entertaining guests and seating as a whole.